Japan has released the Housing Starts y/y, Retail Sales y/y, Prelim Industrial Production m/m, BOJ Summary of Opinions, Unemployment Rate and Tokyo Core CPI y/y. The US will publish Revised UoM, Consumer Sentiment, Chicago PMI, Personal Income m/m, Personal Spending m/m and Core PCE Price Index m/m. 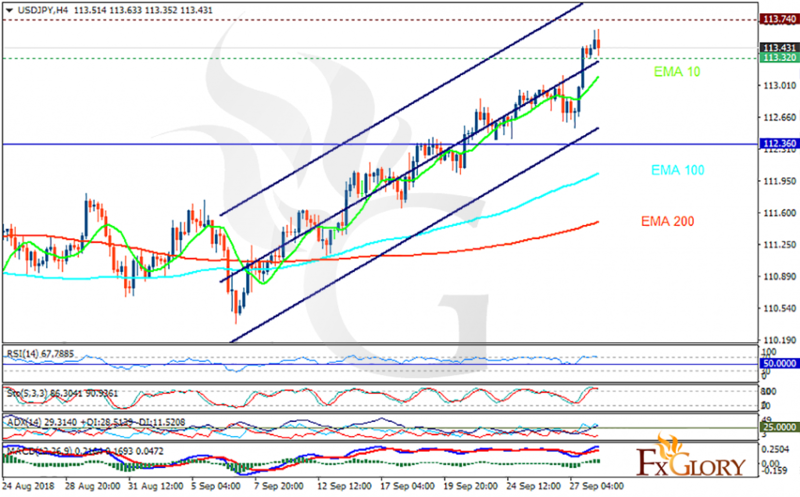 The support rests at 113.320 with resistance at 113.740 which both lines are above the weekly pivot point at 112.360. The EMA of 10 is moving with bullish bias in the ascendant channel and it is above the EMA of 100 and the EMA of 200. The RSI is moving in overbought area, the Stochastic is moving in high ranges and the MACD line is above the signal line in the positive territory. The ADX is showing buy signal. USDJPY will continue its bullish trend towards 114. Pullbacks will be inevitable on the way.